Read more "A (very) quick review of 2015"
Re-united: it feels so good.... Re-united: it's understoo- wait, where did everyone go? Read more "Freelancers unite! (briefly) at Drupalcon Barcelona"
You don't have to have empathy to work here, but it he-... actually, you probably do need to brush up on your empathy there, I'm afraid. Read more "Empathy properly practiced is a key software skill"
Read more "Client/agency relationships at last week's Oxford Drupal User Group"
Read more "I'm now working for: Magnetic Phield"
A proper anniversary measured in whole numbers of years means it's official now. Read more "My first year of freelancing"
Maybe we already have enough of one; maybe we need something more. 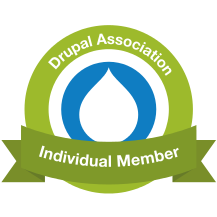 Read more "Freelancers deserve a voice in Drupal"
Read more "My first quarter-year of freelancing"